The perfect vegetarian meal is the whole bowl tali sauce recipe which also happens to be naturally gluten free. 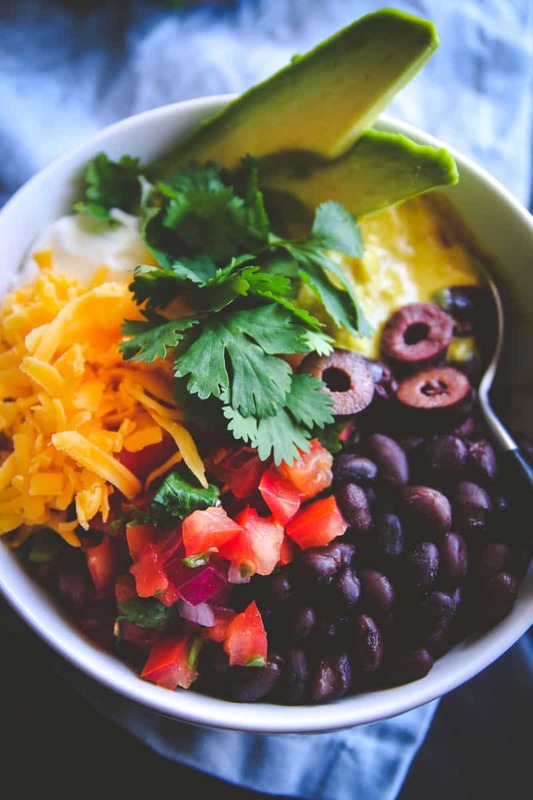 This bowl of deliciousness is also great for healthy meal planning and make ahead meal prep. Just like with the best pumpkin loaf – the whole bowl with tali sauce was needing a little revamping in the picture department. Years ago when I got my first “real” camera for the blog, this was one of the first recipes I reshot – so this is technically a re-re shoot. Here is the picture from 2014, and I still love it, but it doesn’t show all the components that go in the dish, which I’ll share with you. I don’t mind redoing and rephotographing this recipe though, because the whole bowl is SO GOOD, I could make it and make it and make it some more. You know how there are certain dishes that just change your life? Well folks, this is one of them! I first came across The Whole Bowl when my husband (the wonderful hand model in our household) and I visited Portland a few years ago. 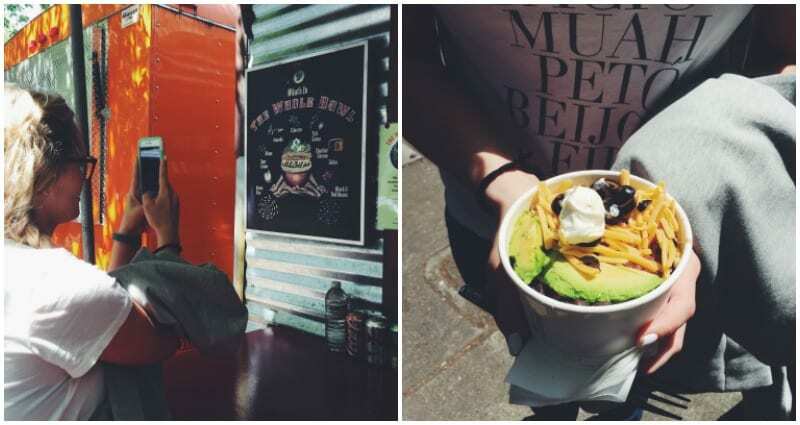 We had The Whole Bowl at a food truck square and fell in love with it. The second we got back I set out to recreating the dish so we could enjoy it at home. 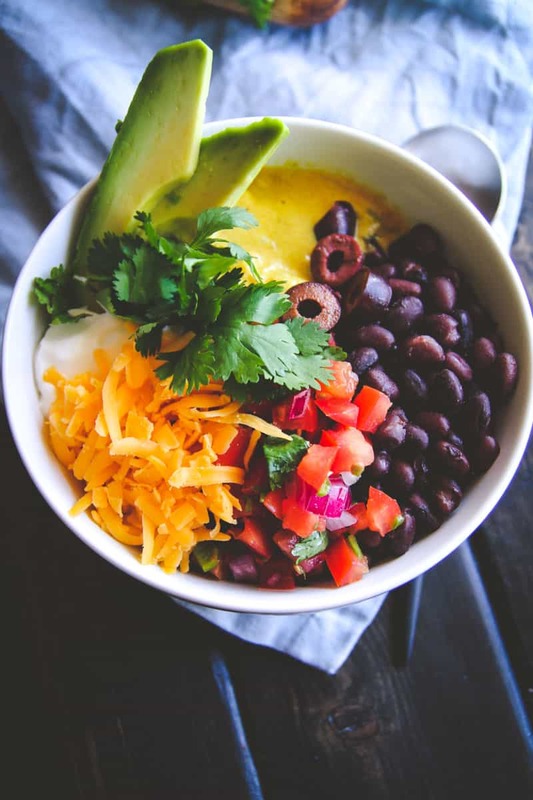 The bowl is said to be ‘like eating a hug’ and I can definitely see why-it’s warming, delicious, and has such a great flavor combination that is tied together by the Tali Sauce. It’s garlicy, it’s lemony, it has a unique combination of spices, and contains a secret ingredient – which is using nutritional yeast (you can find it at health food stores in the bulk spices aisle or in the baking aisle, or buy it on amazon here <- affiliate link, if you purchase it here I get a few pennies, yay! 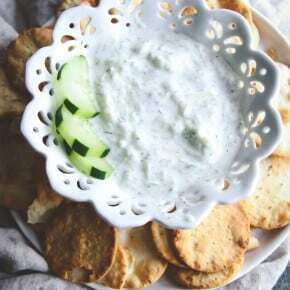 TRY this amazingly delicious and unique dish, it’ll become a favorite! 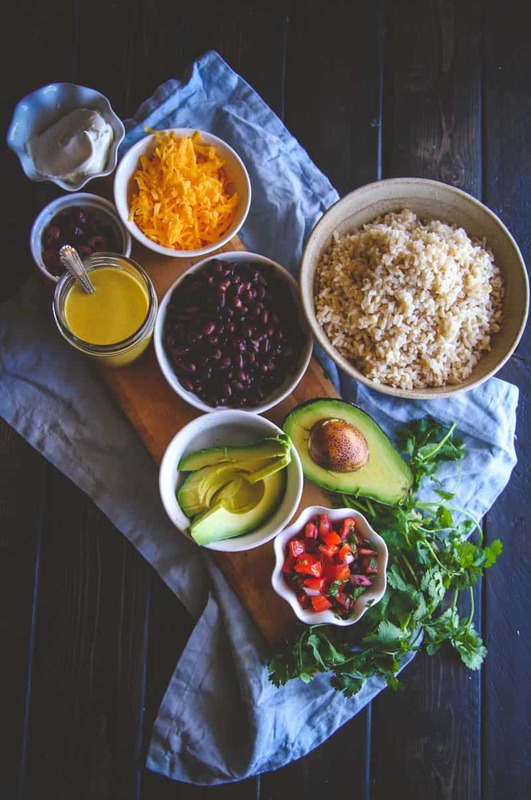 This vegetarian meal is also great for making ahead/meal prepping. You put the rice and beans with tali sauce in one container (which can be microwaved) and then the toppings in another container. Reheating takes one minute. So easy, so delicious! 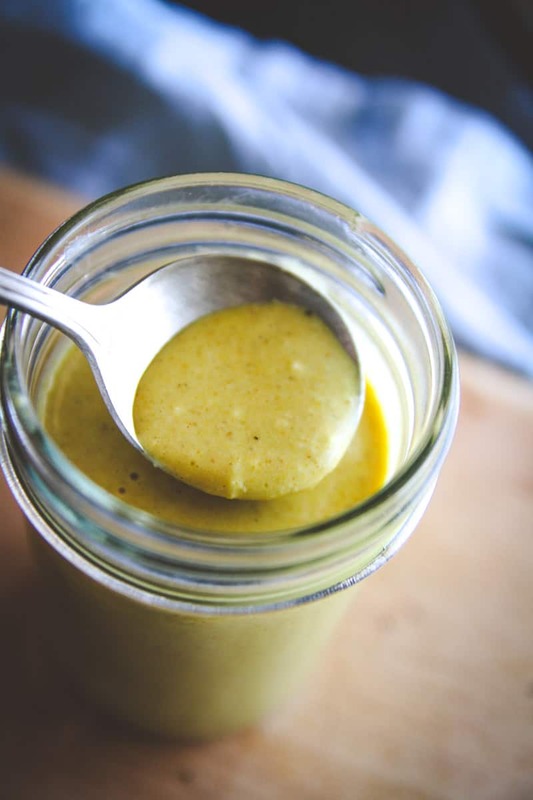 After making this sauce numerous times, I have found that it is best when made in a food processor – like this one (<–is the one I use), and you can buy the nutritional yeast online. Hope you enjoy! 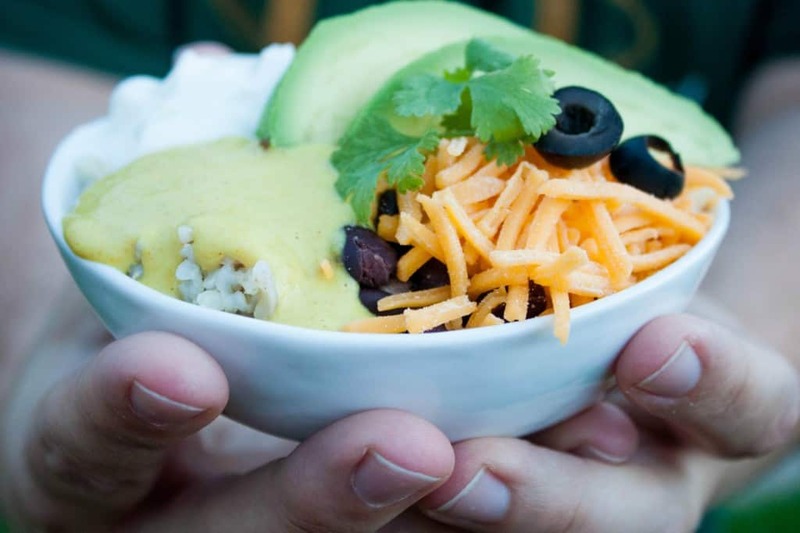 Bowl Assembly: In the bottom of a bowl place brown rice and beans, then salsa, then ½ the amount of Tali Sauce, then the the cheddar, olives, and on the sides the sour cream and remaining Tali Sauce, and top of with cilantro...yum! Some of the above links are affiliate links, if you purchase products through those links at no additional cost to you, I might earn a few pennies to keep this blog going 🙂 Thank you for supporting the SweetPhi blog. 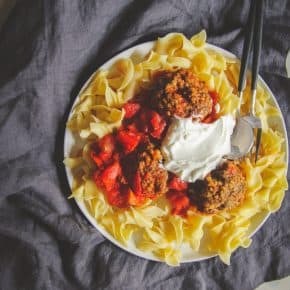 Has anyone tried freezing this wonderful sauce? My son introduced us to this dish now at the VERY least we have it once a week. Oh, and the sauce goes with just about everything! We love it! Hi there! I just got back from a trip to the NW and while in Portland we went to the Whole Bowl and I loooved it! I’m really looking forward to trying this recipe at home. Do you think that onion powder and garlic powder plus extra salt could substitute for the onion and garlic salts? I have the powders just not the salts! Thanks so much! I think you’re going to love this recipe, now I’m totally going to have to make it again because I’m thinking about it 🙂 Yes, definitely ok to use powders, I’d just add an extra pinch of salt. This looks like heaven in a bowl Phi, love the sauce! I need the sauce in my life, your bowls look delicious! I usually do meal prep for the week on Tuesday mornings when the house is a little quieter, I think I’m going to add these to the list for next week, they look so good !!! 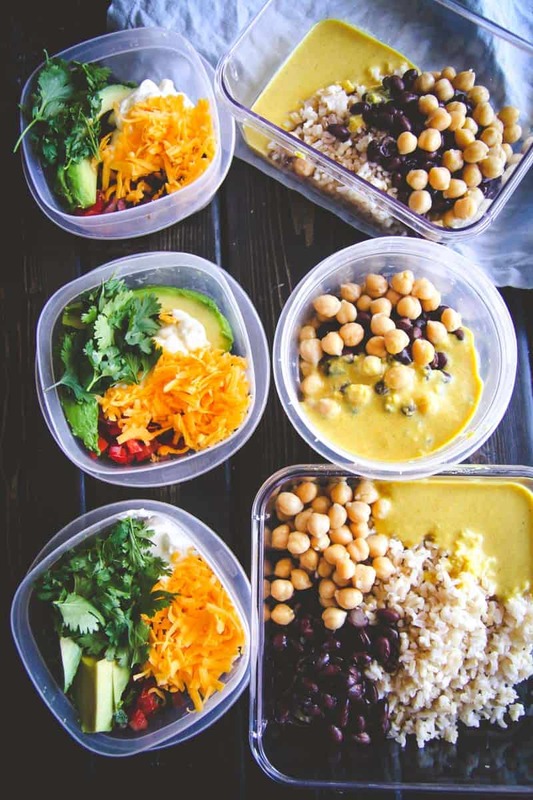 I think these bowls would make the perfect addition to your meal prepping – they’re so delicious! I made this for our Thanksgiving dinner. It was delicious! I only used one clove of garlic because my husband doesn’t like to be overpowered by the flavor. Thank you! 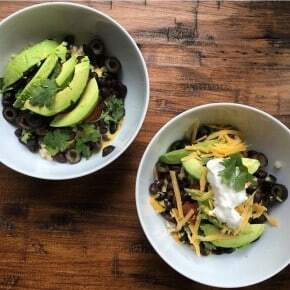 This recipe is just like the real deal Whole Bowl! Thank you! I left out the curry powder (didn’t feel like paying $6 for a new jar) and didn’t miss it at all. I’ll be making these all week! Thank you so much!! I love this recipe too, and love to hear how people modify it, so glad to hear that it turned out great without the curry powder too. 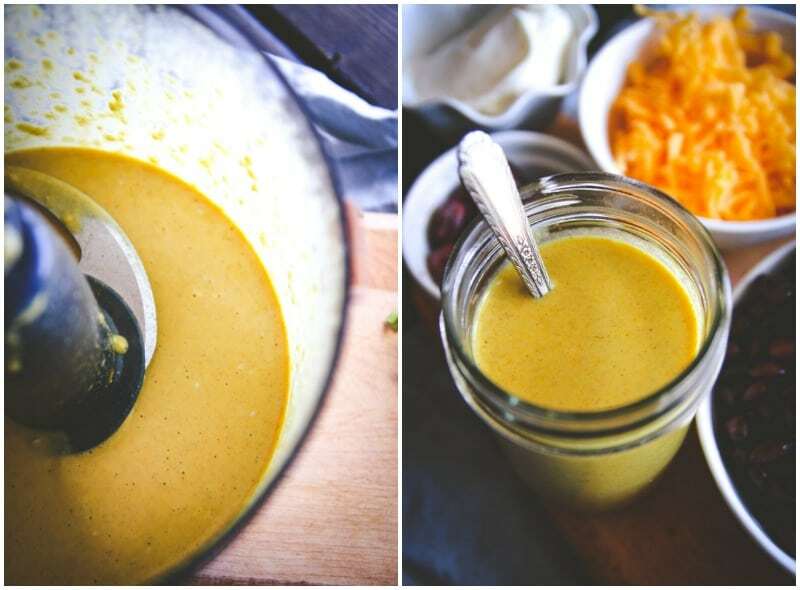 My husband and I made BOATLOADS of this tali sauce for our wedding reception. It was a huge hit. Bunches of people said it was the best wedding food they’ve had. We had a lot left over and have frozen it. We keep thawing a bottle at a time and it makes having a Whole Bowl the easiest thing ever…I bet we eat Whole Bowls at least once or twice a week. I also use Tali sauce on salads, to dip veggies in, on eggs, etc. It’s the best. Thanks for figuring out the recipe. OH MY GOSH! Thank you SOOOOO much for your super sweet comment, I’m so so SO happy to hear how much you like it, and what a clever idea to make it for your wedding reception!! I had Whole Bowl a few years ago when visiting Portland. Last year she opened a location in Cincinnati where I live and it is fantastic (I think the owner is originally from here). I can’t wait to try this recipe! OMG – I saw this on IG and instantly wanted to add to my menu planning. Cannot wait to try this out!! I can’t wait to hear how you like it! I can honestly tell you that of the many things I cook, THIS is one of the things I make most. It takes me back to visiting Portland and trying food trucks (before they were cool lol) and even my husband loves and raves about this dish, so yay for healthy meals that are loved! Can’t wait to hear how you like it! Any idea how long this will keep in the fridge? It never lasts more than a week in our house lol, but this also freezes really well! It’s really good, so I can see that! My boyfriend and I made it as gifts for friends, and we were wondering what we should give them as a “use by” date. Maybe a week? Oh I love that idea of giving it as gifts! I’d say a week and a half! Made this tonight and loved it!! Thanks for the recipe! So glad to hear it, thanks for sharing! My hubby loves this one too!! You nailed this recipe! I live in Portland and often walk to the NW Whole Bowl food cart at lunchtime. The combo of tali sauce, salsa, and sour cream is magical. You really dailed it in! Thank you so much for taking the time to figure out this one. Thank you so much for your comment and feedback!! I absolutely love this recipe and have been making it a lot recently too, it’s just such a good flavor combination! Thanks so much for this recipe! I used to live in Portland and LOVED the Whole Bowl, I probably went there weekly! I made this recipe tonight and it brought me right back!